I had to write about this seventh grade lesson because we did it this week and it was so much fun 🙂 The junior high students have been so crazy with spring fever! I don’t blame them it feels like we live in LA. A few times this week is was over 80 degrees. That is hot for us people at the beach 🙂 Anyhow I brought frozen fruit, kale and my blender and had some of my helper moms make smoothies. We not only finished this project but also started on the end of the year parent gift. The one negative out of it was that I got the flu but I am recovering and blogging. Hope you all enjoy doing this project. Lun Tse and his twin brother were born in Hong Kong, China on February 19, 1964. The name Lun in Chinese means dragon. There were ten children in the humble Tse family. The decision was made to emigrate from China to San Francisco in 1967. For several years, the family lived in the Chinatown section of San Francisco. Within a few years after their arrival, Lun’s father abandoned them. His mother was left to support the ten children alone in an unfamiliar country. She left San Francisco and took her family to Salinas, California. In the much quieter small town of Salinas, Lun’s twin began writing a great deal which inspired Lun’s own creative development. Lun would draw illustrations to accompany stories written by his twin. In high school, art classes were Lun’s focus. He graduated with an art scholarship. Lun moved to Tampa where he worked to pay the bills but was quickly winning awards at festivals and showing work in galleries in Boca Raton. Within a few years after college, he was working full time as an artist. He wrote his first book on painting techniques soon after and his next book is due out May 2005. His colorful paintings have consistently had a richness and depth with remarkable use of light. He is an emerging artist whose work is already collected nationally. Skill Learned: Drawing and sketching fish working with oil pastels and watercolor. 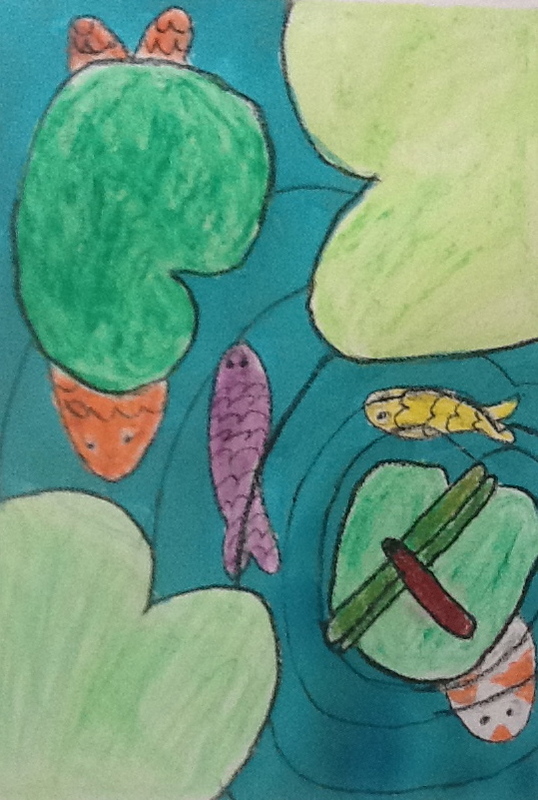 Have students start by sketching their fish or using oil pastel to trace the fish. Try to teach them how to capture the tranquility in the water and the whimsical flow of the painting. When finished with the koi and white swirls for water have them use water color to make the bluish green water.